Preheat the oven to 180c, gas mark 4. In a casserole, heat the oil on a stove over a medium heat. Add the onions, garlic and spices. Sweat for 10 minutes; add the potatoes, cabbage, olives, bay leaves and enough stock to cover. Bring to the boil. Put it in the oven for about 10–15 minutes. Stir in the tomato and add the fish fillets; season. Add more liquid, to come about halfway up the fish, and scatter on the flaked almonds. Return to the oven for 10–12 minutes, until the fish is opaque. Lift the fish into bowls. 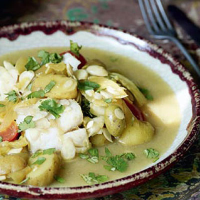 Squeeze the lemon into the stock, season and ladle over the fish; sprinkle with the coriander.